WASHINGTON – Relieved by assurances from Congress that the remainder of the $38 million dedicated to the Japanese American Confinement Sites (JACS) program will be paid, members of the coalition seeking to preserve the funding are focusing on persuading lawmakers to reauthorize it for a new wave of projects. During their meetings in Washington on Feb. 26-28, members of the Japanese American Confinement Sites Consortium focused on the need to preserve the program, which had been eliminated in one recent draft of the Trump Administration’s budget proposal. While the funding was soon restored, members of the coalition wanted to make sure the approximately $11 million left in the program was paid. 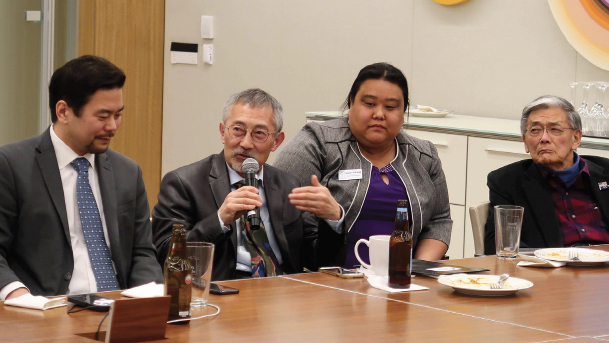 Norman Mineta, former secretary of commerce and transportation, told coalition members that they should try to capitalize on the support they received during their Capitol Hill meetings to seek a longer-term reauthorization. A former incarceree at the Heart Mountain, Wyo., confinement site during World War II, Mineta also served for 20 years in the House of Representatives before leaving for private industry. He advised the coalition members on ways they can advocate for the program’s reauthorization. 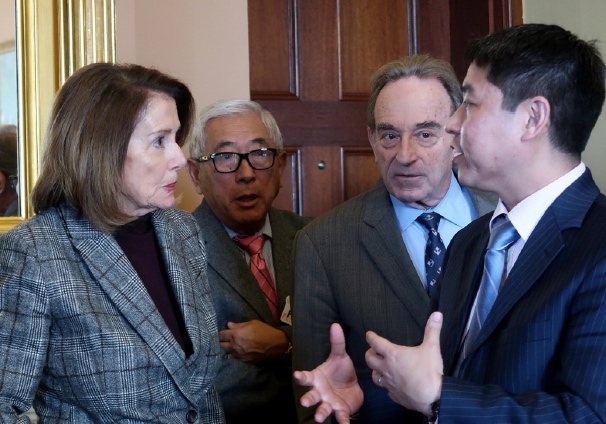 House Speaker Nancy Pelosi (D-San Francisco) seemed supportive of a new authorization and urged the 40 coalition members who met in her office on Feb. 28 to continue to spread the word about their projects and the relevance of the Japanese American incarceration to today’s debates about immigration, refugees and the Trump Administration’s border separations policies. Mineta urged the coalition to reach out to the leaders of the congressional committees that would reauthorize the program – Sen. Lisa Murkowski (R-Alaska) and Rep. Raul Grijalva (D-Ariz.). Both represent states connected to the incarceration, as Japanese Americans living in Alaska were incarcerated during the war, while Arizona was home to two camps – Gila River and Poston. Created in 2006, the JACS program was authorized to spend $38 million to pay for various programs to rebuild parts of confinement sites as well as educate the public about the incarceration. In 2018, the program funded 40 projects worth $2.9 million, ranging from $13,464 for the Friends of Minidoka to digitize items in their collection to $398,272 to Full Spectrum Features to produce two documentaries about resistance to the military draft and the resettlement of incarcerees around the country during World War II. So far, about $27 million of the JACS money has been spent, which gives the program about three more years left on its current funding level.